“Hi, my name is Melanie, and it’s been 6 months since I last posted”. Because I’ve also started sewing a new jacket (for me). Marfy 3022! The muslin for it is getting me very excited. Even with no adjustments I really love the proportions. 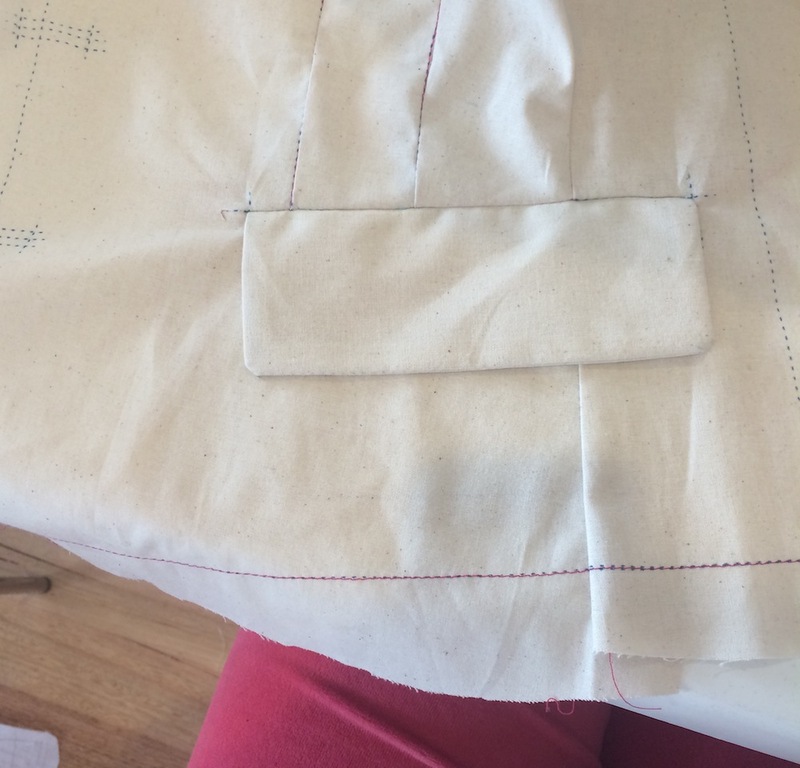 Having been out of sewing practise for so long, and also because this pattern had a rather tricky looking dart/pocket configuration – I went to a lot more effort than I normally would in a muslin. Regardless, it’s so lovely to be back and sewing!! It’s lovely to see your inspiring makes back on the screen, too! Welcome back. Love your jacket style and can’t believe the effort you’ve put into the muslin. Thanks Gail :) That jacket pattern had so many new-to-me things in it, and also I wasn’t sure of the style on me (it is a short jacket) so it made sense to me to get an idea of proportions – also having been out of practise for so long means you can have a construction order sorted! Welcome back! It’s nice to have you treading water with the rest of us! I love reading about your sewing adventures. Your sneak peeks are looking fabulous. Keep ’em coming! Spoken like I would expect Christy to speak ;) And that path is more than likely the one I’ll take! Good to see you back! I am very much intrigued by the first fabric and, obviously, the garments! that is a lovely jacket and your muslin looks good. Glad to see you back. I’m sure you are happy to have a liveable house! The muslin looks great and was a good way to do a trial run of the pattern. I’m looking forward to seeing the finished creation. Oh aboslutely Mary – especially having some space back to sew! I’m dying to start work on that jacket… but keep reminding myself I should really finish my mum’s Frenchie first. Sewing for others is tough! I can see why that jacket excites you – really lovely details! 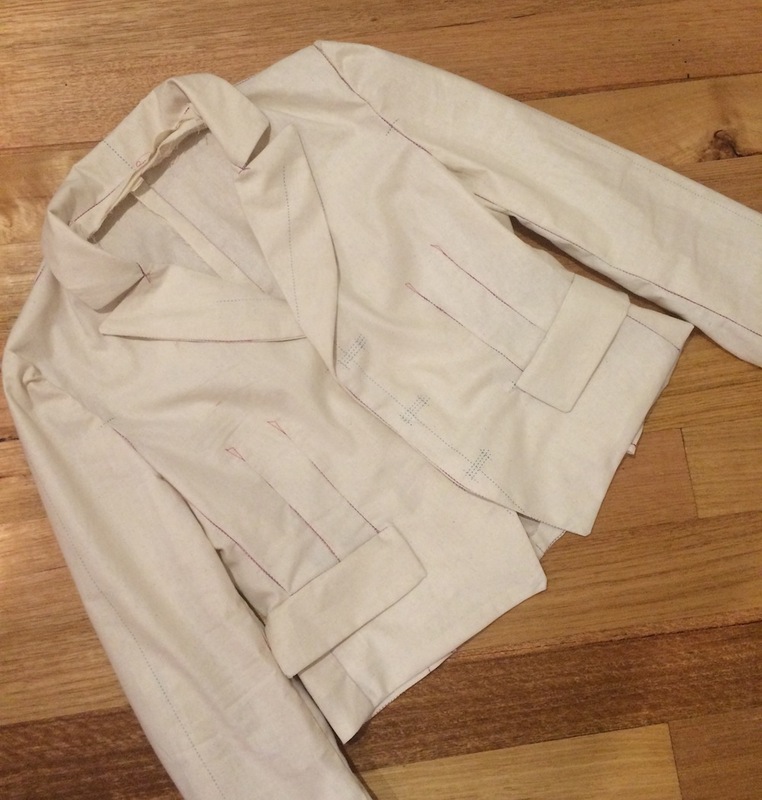 I’m also working on a jacket and since I sew them so infrequently, I will also work out all the construction details in muslin first. It’s the only way to be sure of what I am doing. Looking forward to pictures, and congrats on the new home. 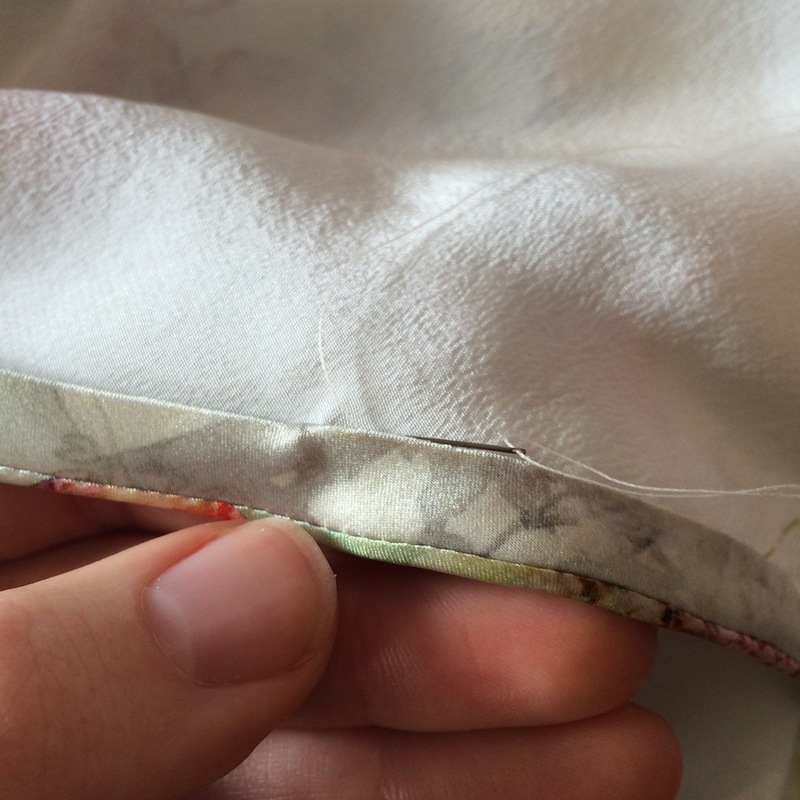 That seam join… divine! For the jacket, can you just add a little to the side seams that could later be taken in? It’s a beautiful pattern, I really love the front seaming! Nice to get a post from you again, hope you find that elusive sewing time! Hi Lisa! It’s rather lovely, isn’t it! I’m sure I’ll figure out something for that jacket… And after such a long break away, I’m all for making sure the elusive time for sewing is very non-elusive! Welcome back! Now if you’re smart, you’ll just prolong the making of your mothers jacket by a little bit more, and stealthily turn it into a Christmas present! And that would be exactly what would happen, were it not for her wanting it for the end of August to take on a cruise! And I just can’t miss a second deadline… haha, Thanks Debbie! 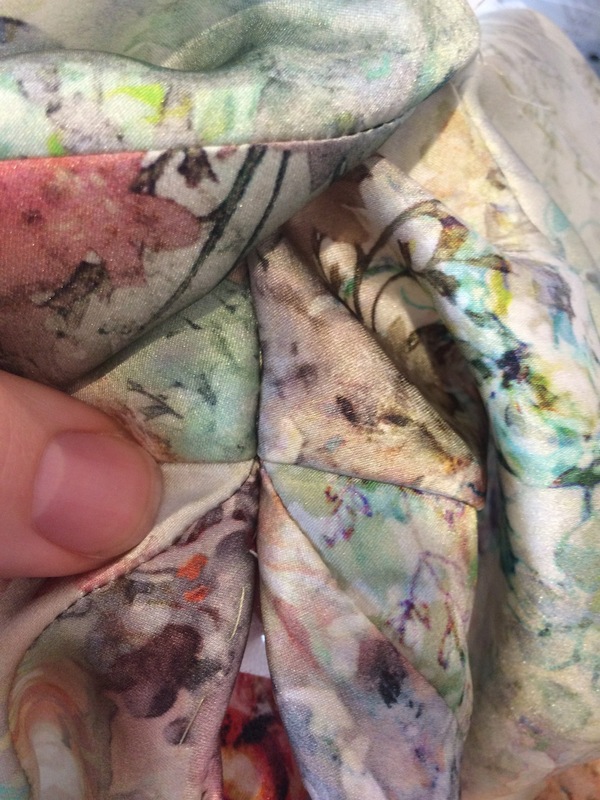 Oh how I’ve missed these sneak peeks into your sewing world!! You really make some of the dreamiest stuff! I’m excited to see yours and your mom’s jacket – and I’m so excited to see what that gorgeous little converging of seams is!! yay, welcome back! that looks like a great jacket pattern and you could even change it up, longer etc. once you get the fit figured out. Do you need to order a new pattern or can you adjust the one you have? and love those darts/pockets combo. I have a Vogue pattern very similar I have made so many times. I think the 2 vertical darts gives a nice shape in the front. Hi Beth! I really could probably just adjust the existing pattern – it’s a snug fit all over, even at at the shoulders which leads me to think that is the design of it, seeing as this size has always been a great fit at the shoulders for me. I would have to order another pattern, and to be honest I’m not even sure they make this particular one in a 48! They seem to stop at 46 for a lot of their pattern sizes. The 2 vertical darts at the front give amazing shape!! I’m very smitten with them, especially now I know how to put it together and the seam junctions there don’t seem nearly as scary. It certainly does – nice to know I’m not the only one whose fallen subject to a bit of renovation weight gain ;) Thanks Amy! Misery loves company, right? Having recently bought and moved into our first house, we hastily ripped out the kitchen. Now two months later, we’re still “camping” — washing dishes in a pail and cooking on the (BBQ rain or shine). We’ve also tried just about every takeout in my city. Thank god I’m not alone in this sewing/reno crisis. Hope it’s soon over for the both of you! I am so glad to see that you will be returning to your blog. I have had a lot of experience with weight fluctuations, and recommend against either making a jacket that doesn’t fit you now, or making one in a size you are confident is temporary. If I were you, I’d work on my mother’s jacket, and less fitted projects, until I got back to my normal size. If you make the jacket fit you now, it might discourage you from losing weight, or it will soon go to waste. Both options are a lose. If you make it in your usual size, you won’t be able to wear it now, and it may not fit right when you get back to your usual weight, because sometimes our bodies change shape after a weight loss, even though we return to the same weight. So there is a likelihood of things not working out with this plan either. On the other hand, there are lots of things you could sew, which would fit you at either size. Welcome back! You’ve been missed around here! I can’t wait to hear more about your sewing, and I feel you on the house front. We’ve been living without a kitchen for over a year now. And, there are a million other house projects that also need to get done, but we’re being good and not tackling them just yet since we don’t want to be dealing with too many fronts. Crazy times in the land of new homeowners! Thanks Amy! Oh my, no kitchen for over a year – how are you handling it?? We don’t have an oven or stove top, but the rest of the kitchen could be considered ‘functional’, and I recently got a little portable induction cook top which really made a difference. It’s definitely best tackling one front at a time though… which is super frustrating when there are so many fronts that need facing up too!! We’ve been using two induction cook tops and a microwave in our spare bedroom as a kitchen, so it’s not as bad as it seems. We actually have more space in our makeshift kitchen than we ever had in any of our apartment kitchens! It’s just tough washing dishes in the tub! 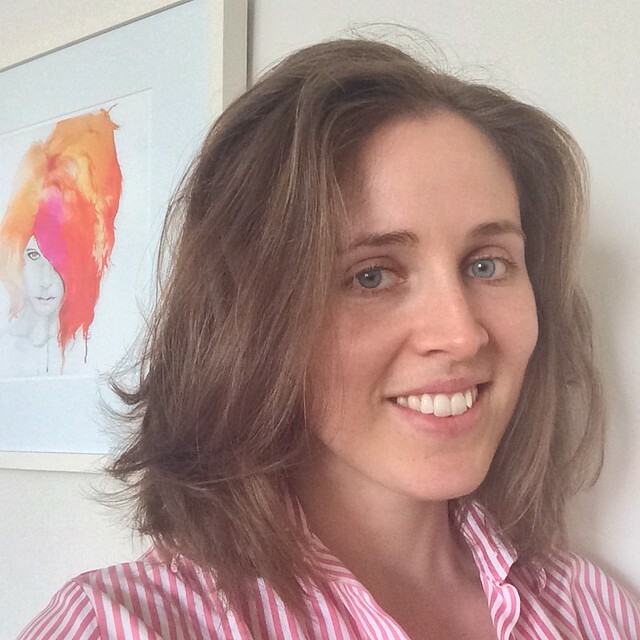 Welcome back Melanie, looking forward to reading you great posts, which I’ve missed. I sew every day but too busy to post anymore and DD has moved out, so very hard to pin her down for photos. Good luck with the renovating, all worth it, in the end. Your wedding dress inspired me to make a couture dress for Jess, and I loved every moment – thank you for all the info. It takes a lot of time to post, so I really appreciate the time you’ve taken to document. Thank you again!! Congratulation on the house coming together, it will be so wonderful when its livable! I love that blouse is going to be lovely, the print will be so beautiful on you. The jacket is going to be wonderful! 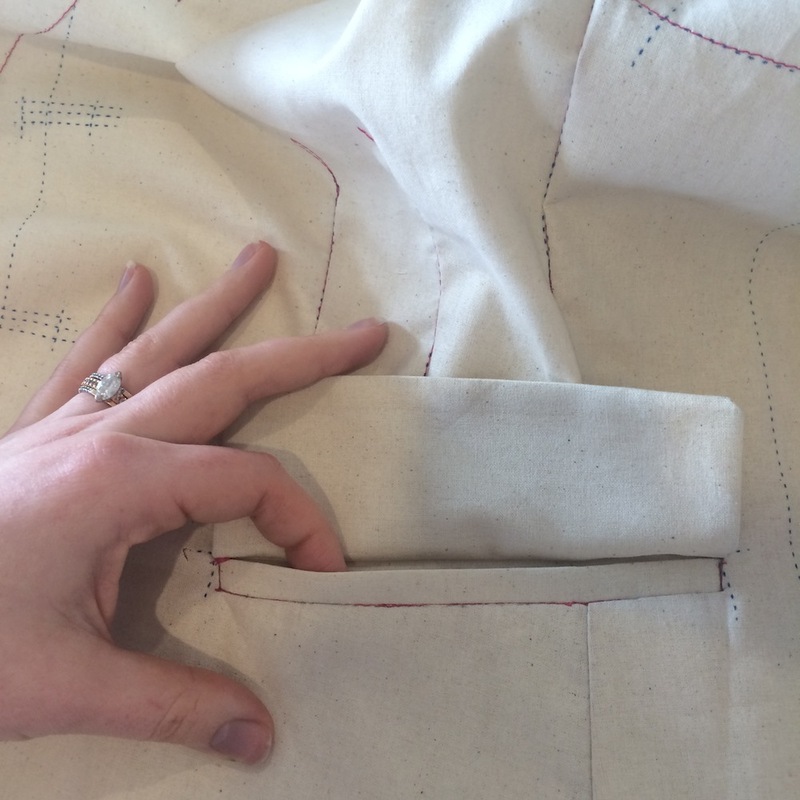 I can’t believe you put welt pockets on a muslin! Nice to see your post. I must admit in the last pic, your fingernails are blue (mine used to do that too in Melbourne winters), and I imediately thought, geez it’s cold!! I’m really curious to see ‘seam matching perfection ‘, so bring on the sun! So good to see you again, fully understand the renovating thing (thankfully long ago now but still memories). Your new top looks gorgeous, and the jackets will be amazing I’m sure. Thanks Sharon – I think the next time we buy a house, it will definitely be in decent condition to start with! haha. It is good to have you back, I missed your posts! I hope you love your new home. The muslin of the Marfy jacket looks awesome already. Missed you, Melanie! It’s so difficult to be away from something you love doing, but so wonderful when it can again fill some hours in your life! The jacket muslin looks terrific – those pockets, done well, are no small feat! Looking forward to seeing the blouse/top and more. I have a solution for your jacket – make it for meeeee! I love it and may have to consider a Marfy pattern after all my self drafted jacket fails. Gorgeous. Oh Marfy patterns are lovely! Nice to see you back sewing! Yay, I’m so glad you’re back! I’ve just gotten back to blogging as well, although my hiatus was considerably longer than yours, so don’t feel too bad. I can’t wait to see your latest projects! So good to see a post from you! It just makes me happy to think of you sewing again. And I would recognize that seam junction anywhere! haha, it’s easy to spot if you know it, right? I don’t think the style really works on me, but I love the top and the fabric so much i’ll wear it regardless. Such a perfect pattern to sew with floaty fabrics (that I so easily am drawn to buying, but find it difficult to pair with practicality!). And I am positively on the edge of my seat waiting for your sister’s wedding dress reveal – on the edge of my seat, I say! I’ll bet it looks great with some of your slim trousers! I’m not sure it looks great on me, either, but it’s just such a cool pattern. I can’t wait to share but am at the mercy of the photographer! Hmmmm, that seam junction isn’t Vogue 1247 by any chance? Maybe not – the fabric looks like it might have too much body. I guess I’ll just have to wait and see. I rarely pump out a blog post these days. I keep up with my blog reading though so I never lose touch! Welcome back. Nice to see you back around these parts! :) Hope you’re well! I am so glad you’re back Melanie! And I have the same problem with the fluctuating weight. I wish it were that easy to drop off those extra pounds that sneak up on you. Good luck with your thyroid, sorting out the house and I’m looking forward to seeing your beautiful jacket in colour. :) Sending you happy healthy karma. you promised photos of your new top…. Six weeks ago! !